On May 10, 2013 a solar eclipse will be visible across Australia, SE Asia and the south Pacific. 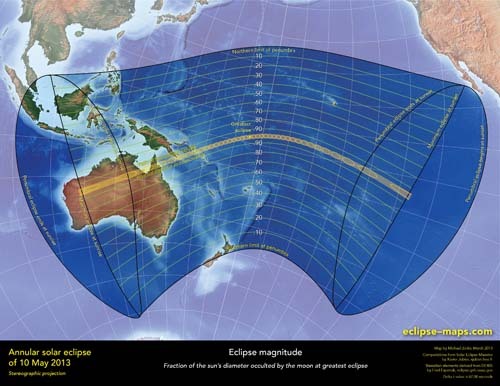 The eclipse is visible as an annular eclipse across a narrow track through northern Australia, SE PNG, Solomon island and one small atoll on Kiribati. Illustration at left. Graphic showing the progress of an annular eclipse. An annular eclipse occurs when the Moon is in the farthest part of its orbit from earth and the Earth is simultaneously, relatively close to the Sun. The solar disk is slightly bigger, the lunar disk smaller and so the Moon doesn’t completely cover the Sun leaving a bright ring of sunlight surrounding the Moon’s disc. The cone of deep shade cast by the Moon and known as the umbra terminates well above the Earth surface. Observers of an annular eclipse stand in an area of lighter shade partly lit by a thin ring of sunlight. This part shaded area is called the antumbra. The above diagram shows why the dark umbral shadow does not reach the Earth. In the antumbra, part of the suns light is always reaching you. modest 94%. Small points of light known as Baily Beads can be seen around the limb. The antumbra first touches down on the Earth surface south of Newman in Western Australia as shown in this NASA animation. "Eclipse map by Fred Espenak, NASA's GSFC"
The antumbra first touches down on Earth in an area south west of Newman Western Australia. It moves at infinite velocity at the point of tangential contact with the Earth. The antumbra crosses a 2800km track of the continent in just 15.5 minutes departing the east coast about 200km north of Cooktown on Cape York Peninsula. From the Newman area, you will miss the first half of the eclipse and the sun will rise at maximum (annular) eclipse. The antumbra moves so fast you'll barely be able to turn your head quick enough to perceive its crossing the sky. Newman is expensive to fly to and being a mining area, even a basic motel costs in excess of AUD350 per night. A caravan park cabin or on-site van is not much cheaper. Even if your particular local circumstances are not listed at the end of this article, you can read them from this map. 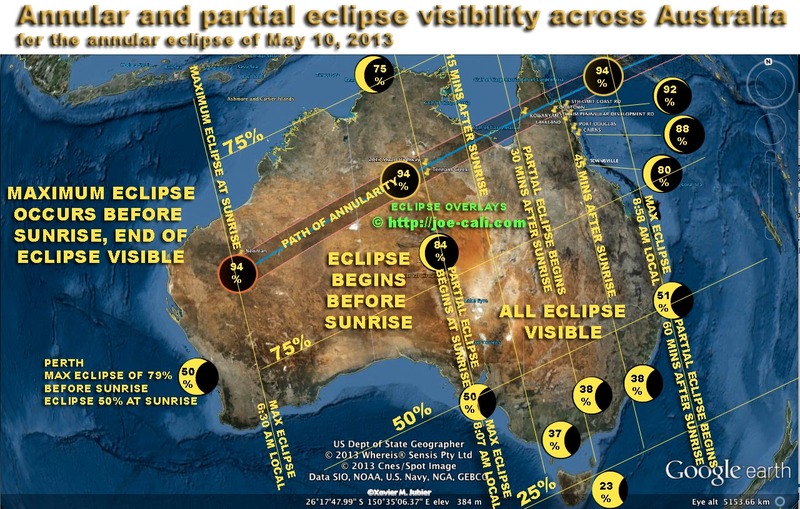 The eclipse rapidly travels ENE 1700km across the Great Sandy Desert and Tanami Desert. Accessible only from remote desert tracks like the Canning Stock Route and the Tanami Track, relatively few people will observe the eclipse from this area. The next reasonably accessible observing location is north of the town of Tennant Creek on the Stuart Highway in the Northern Territory where the antumbra is moving at a more sedate speed of 10 000km/hr. Tennant Creek is near the southern limit and the center line crosses the Sturt Highway about 75-80km north of Tennant Creek. The research institute that employs me has a seismic station at Tennant Creek and staff travel there regularly. It is possible to fly there albeit at considerable expense. The journey from Alice Springs to Tennant Creek is in a light aircraft. The flight is expensive and the flights often encounter bad clear air turbulence during descent. On arrival, no car rental is available so most of our staff opt to fly to Alice Springs hire a car and drive the 500km north to Tennant Creek. If you are thinking of combining your trip to this area with a trip to Uluru(Ayers Rock) bear in mind that Uluru is also 500km from Alice Speings in the opposite direction. The Devil's Marbles are an interesting place to visit and are located about 130km south of Tennant Creek. Two impact craters near Alice Springs are somewhat easier to reach. Gosses Bluff Meteorite Crater is located 175km west of Alice Springs and Henbury Meteorites Conservation Reserve is 147km south of Alice Springs. Currently, (April 8, 2013) Jetstar has flights from Sydney to Alice Springs for $189 each way. If you fly in May 8, Fly out on the 12th, you can hire a Toyota Corolla for $130 with 400km free. You'll drive 500km to Tennant Creek (southern limit) or 600km up to the centre line and same distance back to Alice so find out the excess km rate and factor in an extra 600km - 800km to your budget. Rentals come with 100km per day so if you stay longer, you will have more rental but less excess km. 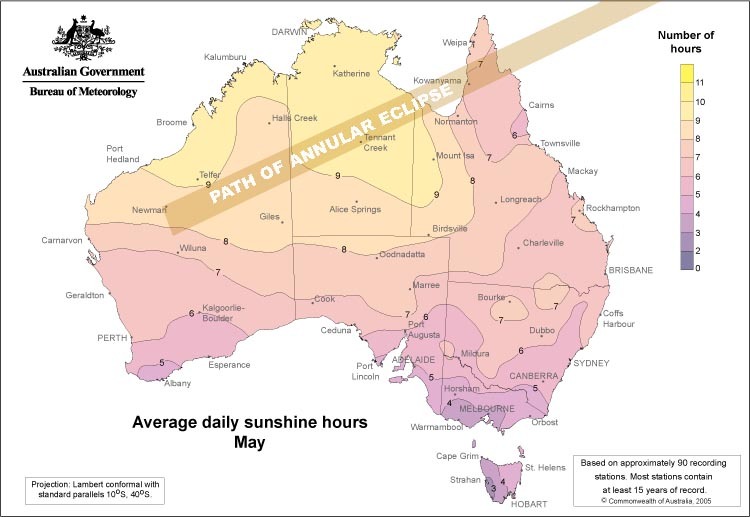 From the Tennant Creek area, first contact, the beginning of the partial eclipse, occurs at sunrise (6:55 AM local time) and the annular eclipse occurs with the Sun and Moon perched 16o above the eastern horizon. The Tennant Creek area can also be reached from Darwin but it is almost twice as far as Alice Spings. The eclipse continues on it’s north eastward journey across the Gulf of Carpentaria crossing the Cape York coastline at Edward River. The centreline passes straight through the town of Kowanyama. Kowanyama is not easily accessible by road but is accessible by a short and inexpensive commuter flight from Cairns. The eclipse begins about a half an hour after sunrise at 7:26 AM with the sun 8.5o above the horizon and maximum eclipse occurs at 8:44 AM with the sun 25o above the horizon. The eclipse crosses Cape York, the anumbra leaving the coast 170km north of Cooktown at a leisurely 5000km/hr. The easiest access to the eclipse path is the Peninsula Development road north west of Lakeland. On following pages I have tabulated local circumstances for a number of towns, cities and locations around Australia and the Pacific Islands. The annular eclipse is visible across the SE of Papua New Guinea and some of the Solomon Islands. 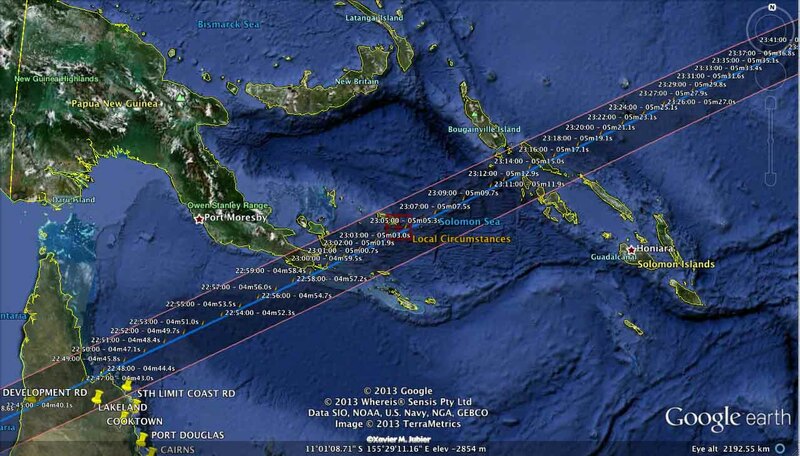 The map above shows the path of the annular eclipse across Cape York, Papua New Guinea and the Solomon Islands. The two numbers printed along the path is the time of maximum eclipse in universal time and the duration of the annular eclipse. Courtesy Google Earth and Xavier M. Jubier. 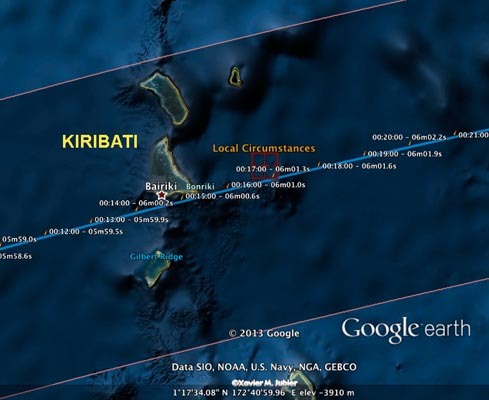 The path of annularity also passes over Kiribati just west of the point of maximum eclipse. Before planning any Pacific Island escapes, be sure to read the weather section. New Zealand lies on the margin of the partial eclipse zone. The most northern locations only see 15% obscuration while much of the north island and the west coast of the south island see only a few percent. EYE SAFETY : How to protect your eyes during a partial eclipse? 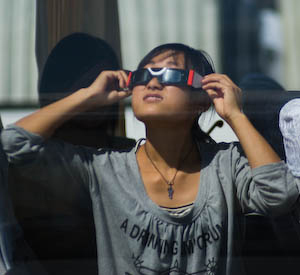 During the partial eclipse and during the annular eclipse, you must use special techniques to protect your eyes. Looking at the Sun at anytime during an annular eclipse or even on a normal day can burn the retina causing permanent eye damage.The Sun is as dangerous to look at during a partial eclipse as it is on any other day. On a normal day, if you glance at the Sun or get the Sun in your eyes for example while you are driving, you don't go blind. But you can't stare at the Sun for any period of time. During the eclipse, you don't have to protect your eyes from glancing contact with the Sun any more than you do on a normal day. The problem is that during the eclipse, there is a temptation to stare at the eclipse for extended periods especially as the Sun gets covered. Staring can cause burns on the retina leading to permanent blind spots. 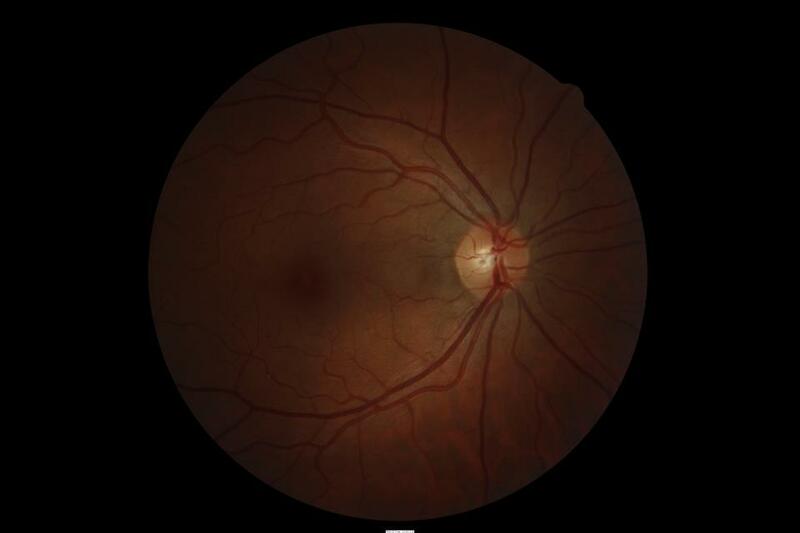 Retinal digital image of a solar eclipse retinal burn. The burn is the dark ring 1/3 of the way in from the left edge. shaped but no photos are available from that time. Using found materials from around the home as defacto solar filters is very dangerous. These materials don't filter the dangerous UV and IR rays and can lead to blind spots even though the image looks dark enough to the eye. Examples of unsuitable filters include pinholes, photographic film negatives, medical x-rays, cd's/DVD's, smoked glass, emergency foil blankets and silvered confectionary wrappersamong many others. There are no materials found around the home that will safely filter the Sun's high intensity light. Some of these materials might look similar to solar filters but they are definitely NOT safe. The best policy is to assume that if it hasn't been made for the purpose, it isn't safe. 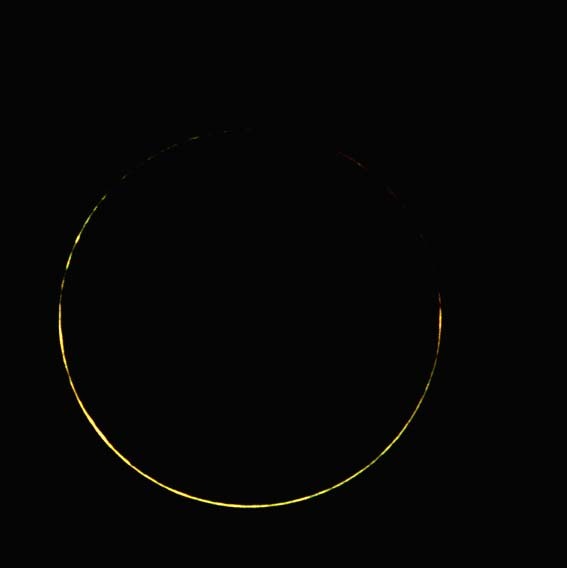 Even during the annular eclipse when the Sun is almost completely covered and the ambient lighting begins to looks like like twilight, the energy in the very thin crescents and annular ring is more than capable of causing a permanent burn to the retina. Eclipse shades are special cardboard frame sunglasses with properly made solar filters built-in. These should be available for purchase from any astronomical equipment suppliers. These are the most convenient filtration method. Do read the instructions. Some of these shades are not rated for continuous viewing but for viewing 30 seconds at a time. 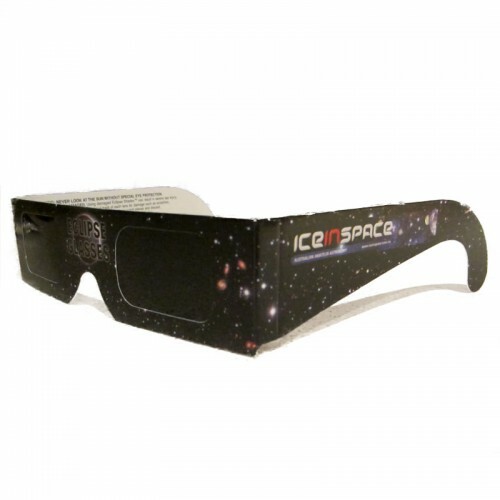 A pair of eclipse shades will probably cost less than $10.00. These cardboard glasses use special filter materials that effectively cut all wavelengths of light including the dangerous IR and UV that defacto materials pass to your eyes. Your eyesight is definitely worth the investment. Other suitable filters are a number 14 arc welding filter available from welding suppliers or a special solar filters available from astronomical suppliers designed to be attached to telescopes or binoculars. There is no Australian Standard for eclipse glasses however there is a European Standard. Look for the "CE" certification on the glasses. 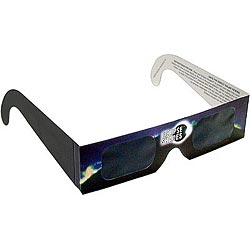 Eclipse glasses are the best way to view an annular eclipse or a partial eclipse. The projection method is adequate for partial eclipses. Priced at around $4-$5 per pair plus postage. Stocks are limited. Order well before the eclipse. However the two maps below from the Australian Bureau of meteorology and the MTSAT image make the weather prospects pretty easy to see without detailed explanations. The maps show the distribution of sunshine hours and relative humidity for the month of May averaged over 15 and 30 years respectively. You can see that Far North Queensland is least favourable with higher humidity and comensurately less sunshine hours. 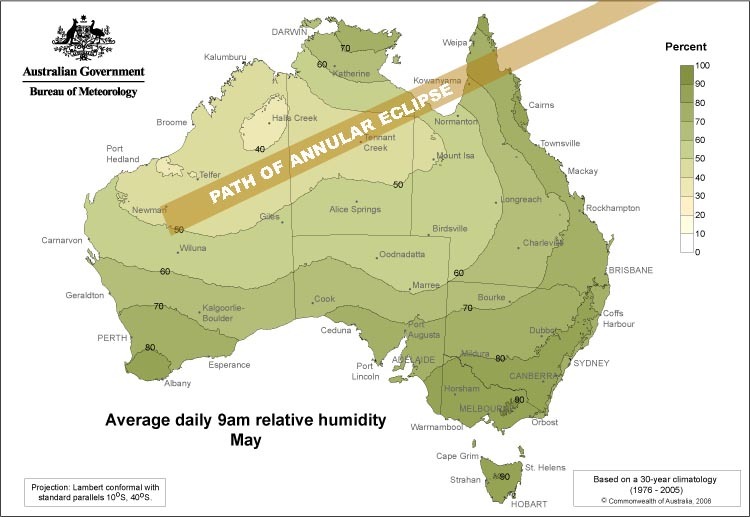 Tennant Creek has the best of the weather, is relatively easy to access and with the partial eclipse starting at sunrise, annular eclipse at 16o elevation and probably offers the prime viewing location for the majority of observers. Newman has slightly poorer weather prospects, much higher expenses. The first half of the eclipse occurs before sunrise and the sun rises at annular eclipse on the horizon. A handful of experienced observers including me, who have already seen annular eclipses high in the sky, are going to Newman for a different experience. Many people I'm aware of seem to be heading for Tennant Creek with a few heading for north Qld. For observers heading out for their first annular eclipse experience, my recommendation would be fly to Alice Springs and drive to Tennant Creek. Just remember that accommodation may be limited so book or bring camping gear. It might be tempting to head for an exotic Pacific Island for this eclipse. As we discovered during the July 2010 total eclipse, weather is not as cooperative as one might hope. 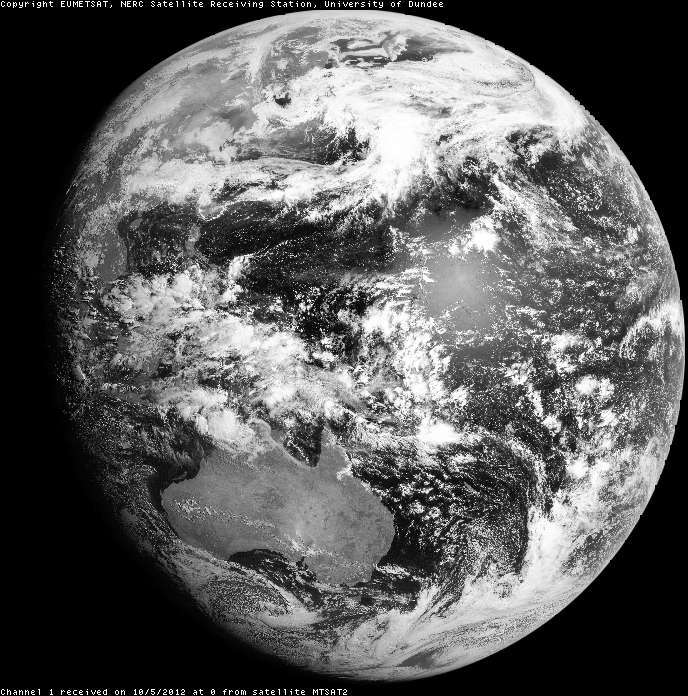 In the MTSAT image below taken on May 10, 2012, it is clear that the weather deteriorates rapidly eastwards from the Great Dividing Range on Cape York out towards PNG, the Solomon Islands and beyond.